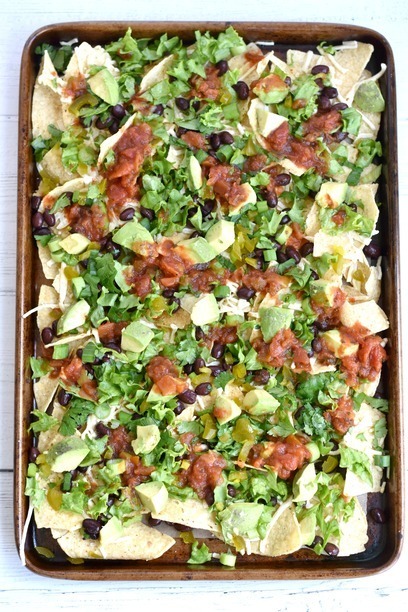 For years now my Hubby has been making me these Sheet Pan Nachos. One of my favorite foods in the world are nachos and once you go dairy free it is not easy finding nachos when you eat out. There is only one place I have ever found that has gluten free and vegan nachos and that is Viva Tacoma in Tacoma, Washington. So, it became our date night in ritual for him to make these nachos while we watch a movie and have some wine. It is truly one of my favorite things ever. My hubby doesn’t cook much, but he makes awesome nachos. I was finally able to talk him into writing the ingredients down and letting me take some process shots while he makes them. The great thing about the nachos is how customizable they are. If you are missing something, or want more of something you do not need to worry. You can not mess this up! We have tried many different toppings, like adding lactose free sour cream. Our most recent favorite topping added is jalapenos. Obviously, if you are not into spicy food then leave that out, but we love a kick! 15 years ago I wanted to dress up and party for date night, but now at almost 35 all I want is sweats, wine, a good movie, and my hubby making me these nachos for date night. You will love how easy they are to make! If my hubby can make it then anyone can! 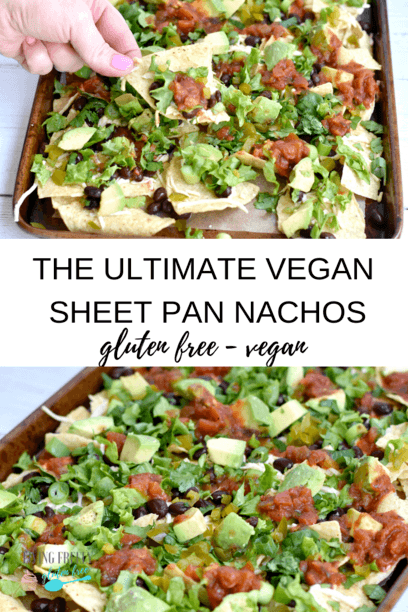 How do I make these vegan nachos? Preheat the oven on low broil and line a baking sheet with parchment paper. Spread chips over the top of the baking sheet. Sprinkle the vegan cheese on top of the chips. Place the baking sheet on the middle rack of the oven and broil for about 7 minutes watching constantly, once the cheese is melted remove the baking sheet. While the cheese is melting you can prep the toppings by washing and dicing everything. Add the black beans, green onions, cilantro, lettuce, jalapenos, and avocado. Add the salsa and lactose sour cream if desired and serve. Enjoy my friends! 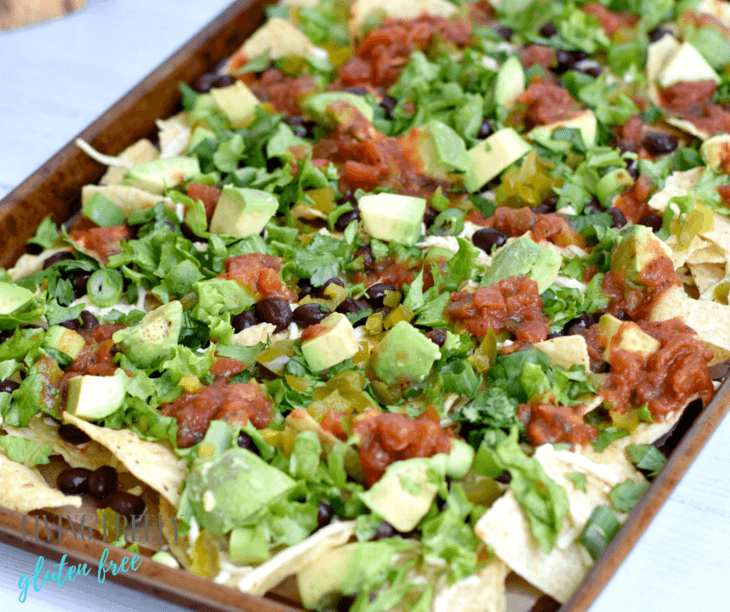 These are the perfect easy nachos that tastes amazing and can be made in a pinch. Prepare a baking sheet by adding a layer of parchment paper to the top. Cover the parchment paper with the chips. Sprinkle cheese on top of the chips. Put the baking sheet in the oven on the middle rack and broil on low for about 7 minutes (watch them though). While the cheese is melting over the chips in the oven, dice the green onions, lettuce, avocado, jalepenos, and cilantro. When the cheese is melted, remove the baking sheet from the oven and sprinkle the black beans evenly over the top. In this order, add the green onions, cilantro, lettuce, jalepeno nacho peppers, and avocado. Layer the top with salsa and/or sour cream as you like.